Who Needs a Cloud Portfolio Management Strategy? Cloud computing has entered the early mainstream of adoption worldwide, and Cloud adoption is accelerating. The rapid rise of Cloud computing has strained IT governance, security and oversight processes as they adapt to deal with new technologies and services. Cloud’s rapid rise to ascendancy has been astonishing. Interestingly, there has also been a consolidation of Cloud service providers as well. This could be due in part to the success of the Big Three cloud providers which include Amazon Web Services, Microsoft Azure and Google Cloud Platform. In a recent study by Synergy published in February 2017, the Big Three along with IBM account for about 63% of market revenue. Therefore, as the adoption of Cloud rises, the competition and choices have declined. Also, the trend now is clear – hybrid multi-Cloud deployments are the rule, rather than the exception. With multi-Cloud deployments, the intent is to have at least two Cloud service providers (CSP) providing similar services, with functional equivalents for core services, as well as some complementary services that one provider may perform better than others. In addition, the hybrid multi-Cloud environment includes private Cloud services provided by internal IT teams. These private Cloud services will be aggregated into a single Cloud service catalog, and will be mercilessly compared to those provided by Amazon, Microsoft and Google, among others. This puts a lot of pressure on the internal private Cloud team to perform up to par with the hyperscale providers, both in terms of price as well as performance and SLA terms. Increasingly, private Cloud services are being benchmarked against public Cloud services to determine objectively and on a comparable basis, whether private Cloud services are competitive with public Cloud services, and that all of the costs have been captured. Often, private Cloud services have not captured all of the actual costs and projected costs over time (including refresh costs, expanding capacity, et al). Management framework and approaches necessary to manage the Cloud adoption process have lagged behind internal adoption of Cloud computing. This is normal. However, as Cloud adoption has raced ahead of internal oversight and management processes, the gap has created a need to rebuild and re-assert control over Cloud adoption and to recruit outside expertise through Enterprise Cloud Consulting Services. One of the essential processes that Cloud adoption requires is a formal framework for Cloud Portfolio Management (CPM). Cloud portfolio management provides a means by which an organization can control and govern existing services, new services, and well as the Cloud providers and the relationship with them. The rest of this post will explore the need for this critical discipline. There are many drivers for Cloud portfolio management. First, we are at a critical inflection point in Cloud adoption where the early mass market adoption dynamics exhibit accelerated interest and adoption of Cloud services. That, however, is coupled with the consolidation of Cloud service providers such that there are really only a few hyperscale providers including Amazon, Google and Microsoft, with the remaining providers being relegated to niche status. Thus, Cloud portfolio management has as a critical objective ensuring optimal competition within your Cloud provider mix to enable the best negotiating leverage possible. Below, we will delve deeper into provider and service mix optimization. Cloud ecosystem are essential. Cloud portfolio management must be used to manage all the Cloud services that will be available via the Cloud service catalog, which is an aggregated view of private and public Cloud services. Another key driver of Cloud portfolio management is to achieve the optimal Cloud services mix. Reliance on one of the hyperscale providers is a sub-optimal strategy, as you lose all negotiating leverage when you commit to a single hyperscale providers. 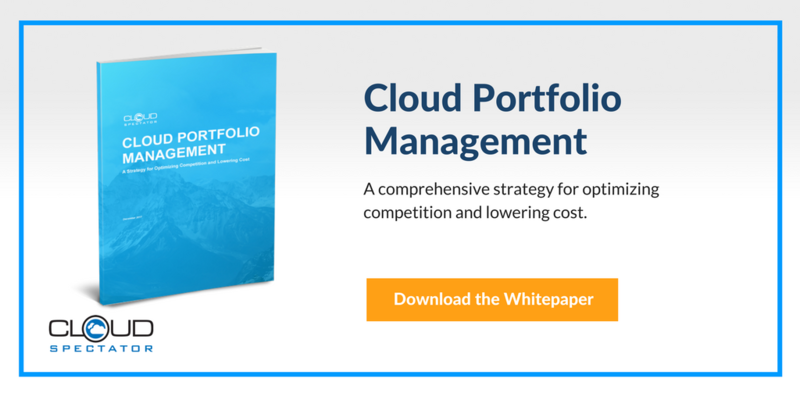 In a Cloud portfolio management approach, the objective is not only to manage the Cloud portfolio, but to achieve an optimal provider and Cloud service mix. There are two aspects of the Cloud services mix to consider: Cloud provider mix and Cloud services mix. Ensure functionally-equivalent services for pricing optimization, which enables a form of Cloud service arbitrage based on the current pricing in your contract. Not all services will have exact functional equivalents, but using price-performance data, you can develop a list of the common core Cloud services that are functionally equivalent for common needs. The optimal Cloud service mix should seek to identify and manage functionally equivalent services for the most commonly used IaaS services across all use cases. This approach will ensure you have service alternatives in case of outages or contract disputes, and also will help with pricing negotiations in the future. Another challenge in the Cloud computing industry is the lack of transparency of Cloud pricing and performance data across providers. First, all the Cloud providers price their services differently, so the first challenge is understanding the pricing model. Second, the sizing and functionality of various Cloud services are not equivalent, so comparing pricing and performance is difficult. Furthermore, pricing plans for individual services change frequently, and thus it becomes almost a fulltime process to continuously monitor and track service pricing changes. This comparative data is not widely available, and Cloud providers are able to exploit the lack of pricing data transparency to their advantage. Figure 1 (see below) best illustrates why performance is an important consideration when purchasing cloud services. As shown above, Provider A’s 2 vCPU machine initially seems like a better choice than Provider B’s 2vCPU machine because it is less expensive. After accounting for the ‘Application Performance Range’, or the application’s performance requirements, however, it becomes clear that Provider B’s 2vCPU machine is actually the better fit. Unlike Provider A’s machine, Provider B’s machine offers the necessary performance capabilities at the lowest cost. 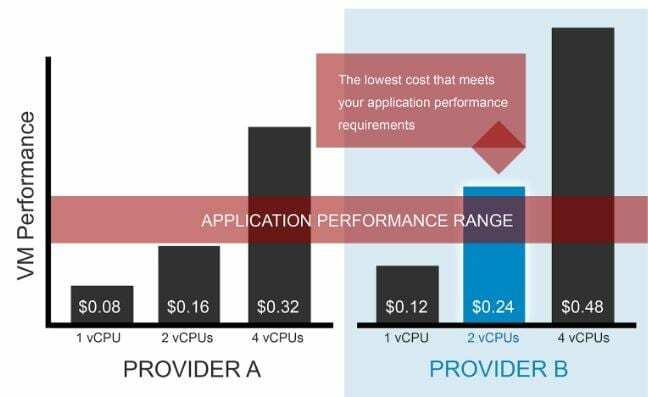 On Provider A, the user would actually need a 4vCPU machine to fulfill the performance requirements, which is 33% more expensive than Provider B’s 2vCPU machine. When purchasing cloud services, customers should evaluate offerings on both pricing and performance to determine a cloud product that best meets their needs. Along the same lines, Cloud pricing approaches are often difficult to compare on an apples to apples basis across providers. While the sizing of tiers of services varies, such that a small VM will not be identical to a small VM from another provider, the relative performance for the price will also vary significantly. It is thus incumbent on the consumer to somehow obtain this information to assist in their contract negotiations, but also in their IT expense forecasting using this data. To learn more about how Cloud Portfolio Management should be a part of your overall Enterprise Cloud Strategy, contact us at any time. In the next Blog on Cloud Portfolio Management, we will examine the key requirement for this emerging discipline. What is Cloud Portfolio Management?